I wish getting pregnant was super easy and required nothing more than a wink at your partner. But it’s not! Especially for PCOS sufferers. PCOS sufferers have to literally prepare for getting pregnant! We really need to take time and prepare for conception- and even then it’s not guaranteed. Get Bloodwork – Test all your hormone and HCG levels. Some women need Progesterone suppositories to conceive, others do well with Soy Isoflavones supplements. Your doctor will be able to see any problem areas and address them. Have your Partner Tested– It’s a good idea to have your husband get tested as well. A GP or fertility doctor can order a sample. Start Acupuncture– It takes at least 90 days from when you start acupuncture for it to affect your fertility. This does not mean you need to go to an acupuncturist for 90 days- you only need to go 1-2 a week for about a month or two. Read PCOS Girl’s Acupuncture and Fertility experience. Start Working Out- Try to workout at least 30 minutes a day. Any workout will do: walking, elliptical, jogging, trampoline, Wii, dancing in your living room- etc. Eat Healthy– Ditch the fast food, try to eat organic and natural. Add more greens to your smoothies and salads and up your fish intake. Ditch the sugar and carbs. Hysterosalpingogram (HSG)– Go to your OB-GYN and see if you’re a candidate for an HSG. If you’ve never heard of this, then I encourage you to Google it. This procedure checks for blockage in the Fallopian tubes. It is not a pleasant procedure, but it only lasts about ten minutes. Many women get pregnant after having this procedure. Stop all Nitrates– This applies to you and your partner! Studies show that bacon (with nitrates) harms sperm quality and quantity- read more about Bacon & Sperm Quality! Try to De-Stress– If you have stress in your life- fix it now! You want to be carefree and happy when trying to conceive. Your stress levels affect your adrenal glands and your adrenal glands affect your hormones and your hormones help you conceive. Read my post about Adrenal Fatigue and it’s affect on your body. – It’s important to know when you actually ovulate. Some people ovulate on cycle day 13, others on cycle day 21. 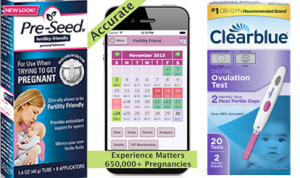 You can chart your BBT (basal body temperature) or use ovulation sticks that are similar to pregnancy tests. Start tracking this to see if you are actually ovulating and if so- then when. Three months should give you a solid idea of what your body is doing. You can track all the data on a fertility mobile app or website. * OPTIONAL* Start Eating Edamame (soy beans)– If you feel iffy about this- then skip it. It worked for me so I am all for soy beans- but some say soy is very bad for women with PCOS. I eat them the first two weeks of my cycle and then stop. to help with ovulation and egg maturity. You will take these at the beginning of your cycle, before ovulation, as instructed by your doctor. Use Pre-Seed Personal Lubricant – (available at Target and Amazon)- use as directed. Read the reviews on Amazon, it’s quite encouraging. My acupuncturist also recommended Pre-Seed for helping to conceive. It comes with applicators and directions. This lubricant helps the sperm get where it needs to go. This is especially important when you’re trying every other day for a couple weeks. Change Positions– Orgasms help get the sperm to the egg. So enjoy this time with your partner. Also, various positions have been noted as more efficient then others. I won’t get into all that TMI here. Switch Up Your Timing– Try to schedule your baby making sessions at different times. Switch up between AM and PM. Cover all your ground- so to say. I wish all my fellow PCOS girls good luck on their mission to conceive! Please share any other tips and helpful hints below! We are all in this together!! In the meantime you can start your dream Baby Registry and get those happy thoughts flowing! 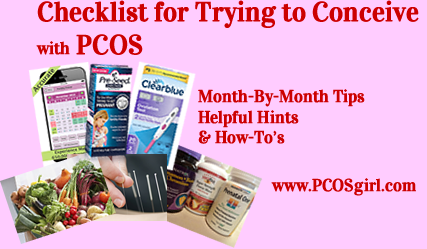 This entry was posted in PCOS, PCOS Infertility and tagged infertility, trying to conceive.